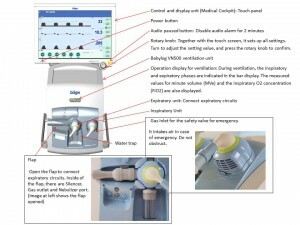 As a successor of Babylog(R) 8000plus, Babylog VN500 took over the same operation principle of Evita series which were the high-end ventilators for adult patients. HFO performance of Babylog 8000plus was improved with VN500. New ventilation mode, VG (Volume Gurantee) combined with HFO is available. VN500 provides excellent conventional ventilation with “automatic leak compensation” and “VG”. 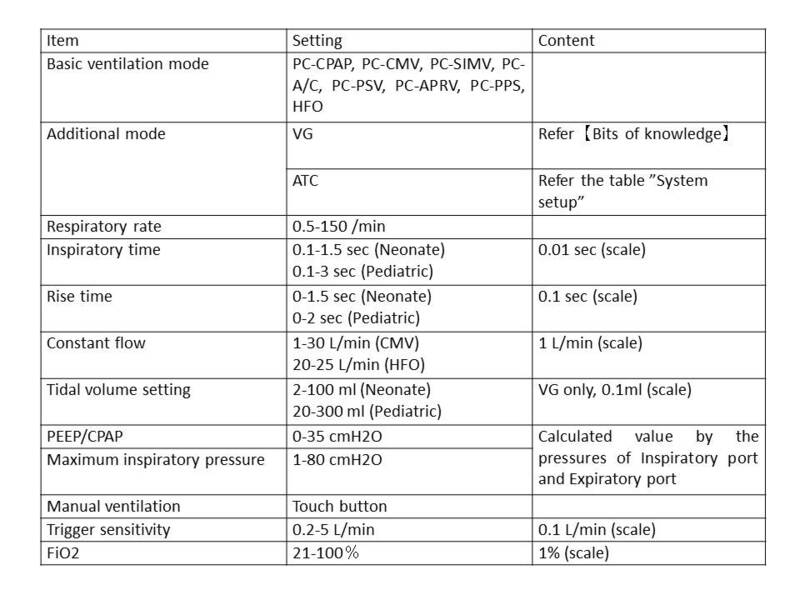 In addition to those functions, VN offers extensive neonatal ventilation therapy, including MMV (Mandatory Minute Volume Ventilation), APRV (Airway Pressure Release Ventilation), PPS (Proportional Pressure Support), Sigh, HFO VG and ATC（Automatic Tube Compensation）as options. In Neonatal Care Area, there are several functions that its intended use or its efficacy of therapy is not defined, yet. Therefore, correct knowledge of each function is necessary. This manual is divided into 2 courses (“Basic” and “Advance”) and describes the operation of VN500. The user interface of the device is a touch screen. The user simply selects items on the screen and confirms the selected value or changes by pressing a rotary knob. Monitoring area and main menu bar in the main display can be customized. Because 3 screen configurations can be pre-set, for instance, the user can easily switch the screen display between normal ventilation mode and HFO mode by touching a single button. The device contains internal battery and it should be charged even when it is not in use. 3 screen configurations can be pre-set at the system set-up menu. With VN500, though PSV is basically named as “PC-PSV”, the name would be changed to “PS” when it is used during SIMV. 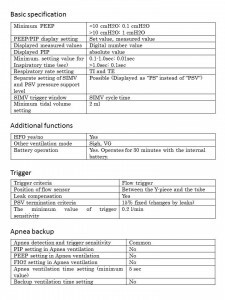 The device records the previous patient information or ventilation settings. The instruction of how to admit new patient is explained in below. By pressing the main power button, the system gets started and opens up the start dialog window which shows selections of “Current patient” (previous patient) or “new patient”. 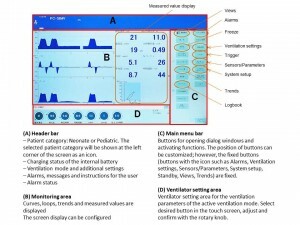 Once “new patient” is selected, the new screen (Figure 1-a) will be displayed. 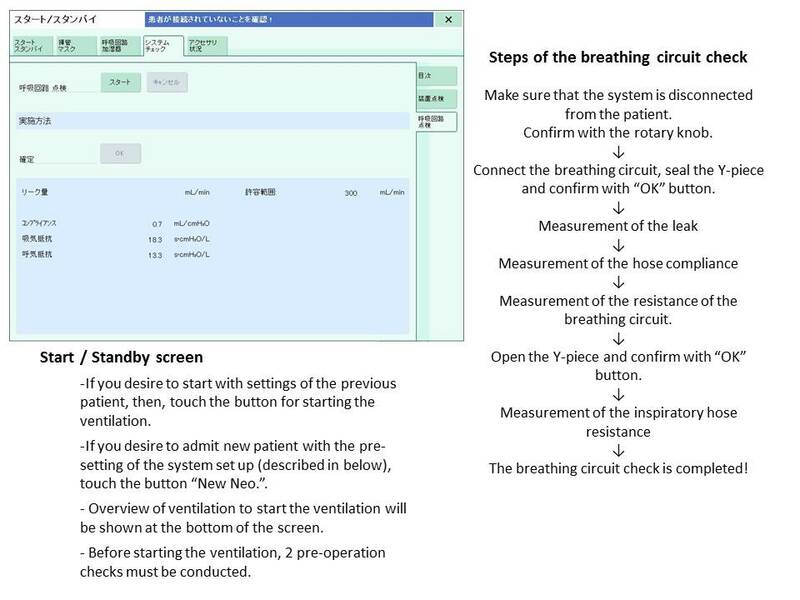 For the first time use, please press “System check” tab to start up the device check and the breathing circuit check before starting ventilation. Steps of the device check will be instructed by screen dialog. The following breathing circuit check should be conducted as steps described in table 1-b. In principle, those inspections should be conducted for the first-time use. 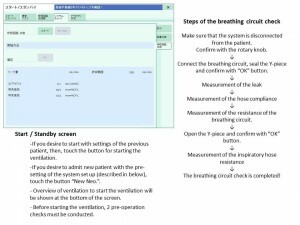 By selecting “Current patient” button, the device automatically starts ventilation with the last used patient-related settings including ventilation settings and circuit information. If preventive system check is not possible, biomed can conduct the system check and setting previously. The system setup offers the configuration options to set. The user can activate or deactivate a short cut key to be shown, however, those displayed icons to show categories are not able to hide and further categories are displayed under the icon. 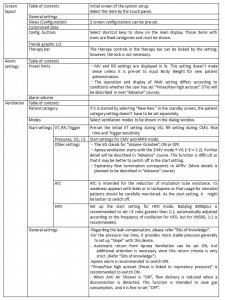 The chart “Overview & cautions of system setup window” shows the recommended configuration settings. 3 kinds of screen configuration can be pre-set. 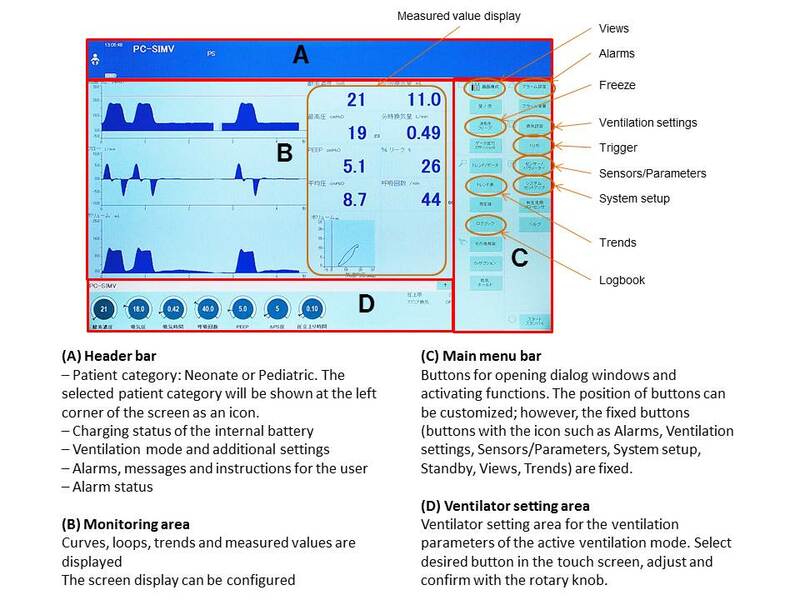 For instance, you can set different monitoring screen configurations CMV and HFO, depends on the ventilation mode. The system setup has no icon, and its button cannot be hidden. The system setup is special for that the user is not able to set up anything without this setup button. The ratio of MVespon to MVe is greater than 25 % and the ratio of MVleak to MVe is less than 40 %, 80 % of the mandatory breaths are triggered as spontaneous breathing. Because this condition is very high, the user has to deactivate Apnea ventilation manually to switch back to normal ventilation. For this reason, Apnea ventilation setting needs to be adjusted carefully. The device contains 2 types of leakage compensation. One is automatic leak adaptation which supports trigger sensitivity for inspiratory trigger or expiratory termination during PSV, and this function was already installed in Babylog(R) 8000plus. 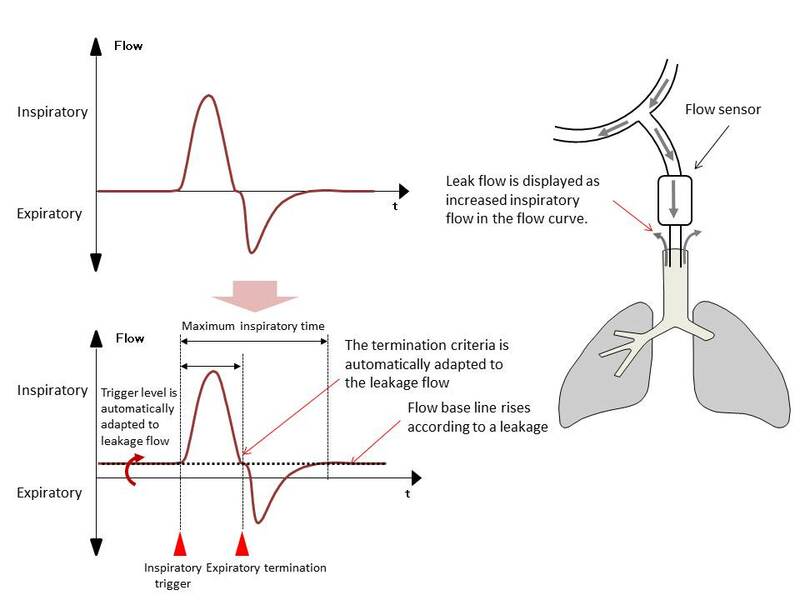 It is described in my previous course “Babylog(R) 8000plus Basic”, when there is a leak with the uncuffed tube, the inspiratory flow would be increased because of leak flow. As the result, the basic line of flow curve will be positioned higher than before. Babylog(R) series adjust this basic line automatically (Zero flow calibration) so that the user does not re-set the trigger sensitivity or termination level even when a leak occur (Figure 2). Another one is new function which is introduced with VN500. 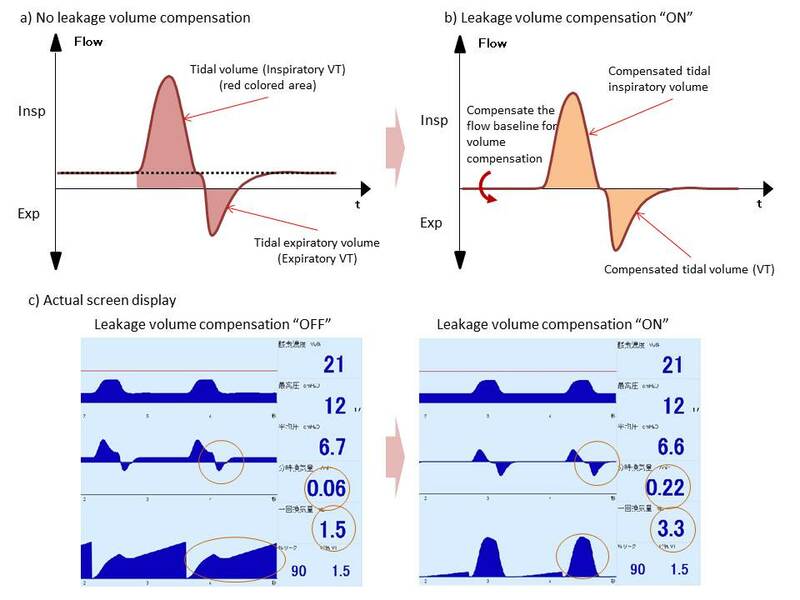 That is “Leak compensation” which compensates the tidal volume while a leak occurs (Figure 3). The delivered volume is equal to the area on the flow curve. When we divide this area by Inspiratory and Expiratory, the area above the basic line is “VTi” and below the basic line is “VTe”. If a leak occurs, the expiratory VT might be underestimated. With the leakage compensation “ON”, the tidal volume measurement would be more precise by re-setting a baseline of the flow curve. As the terminology of this device, various names such as VTi, VTe and VT are used. 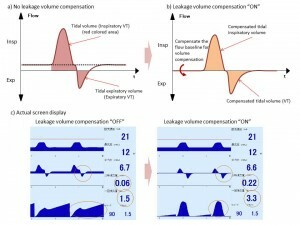 Though VTi and VTe are values before the leak compensation, VT will be either the value after the leak compensation when the leak compensation is ON, or equals to VTe when the leak compensation is OFF. This function made VG available with the leakage rate 30-60%. These 2 compensations are difficult to recognize differences. 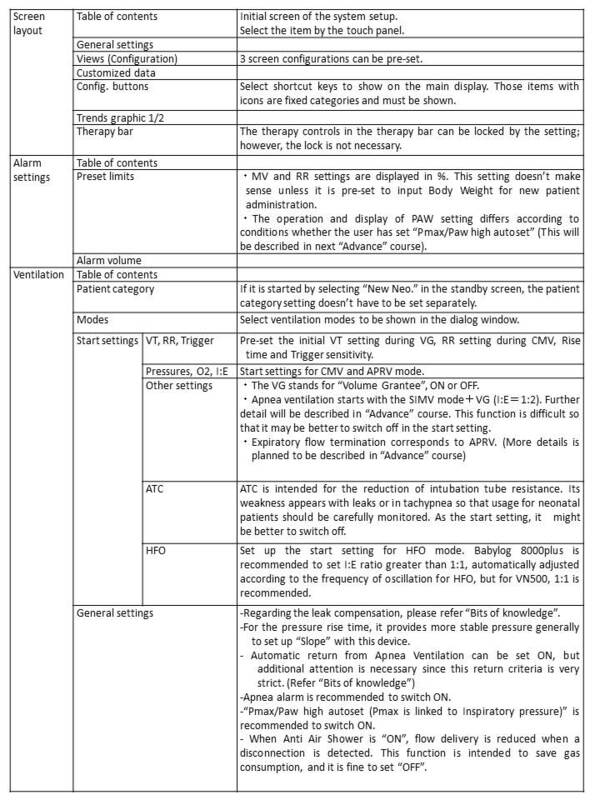 The function which appears in the initial configuration setting in the system setup => general settings for ventilation => Leak compensation means “Leak compensation in VT”. On the condition of switching off this function, “Automatic leak compensation” for trigger sensitivity compensation is still active. Under the ATC tab in the system setup screen, there are buttons named “Inspiratory compensation” and “Expiratory compensation”. These buttons are nothing to do with the leak compensation. 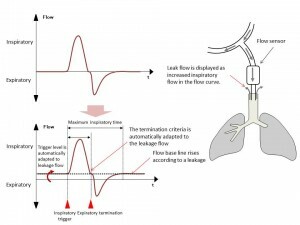 As the terminology, there are “Inspiratory MV”, “Expiratory MV” and “minute volume” for “MV” group. They can be differentiated themselves from each other in the same way as “VT” group. Leakage rate is measured constantly and calculated the average value for 18 seconds. Leakage rate = 100 % x (MVi – MVe) / MVi. 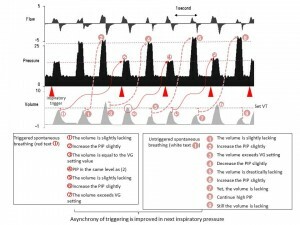 VG is the function which automatically adjusts the inspiratory pressure between PEEP and PIP to reach the set tidal volume. This function was described in “Babylog 8000plus Advance course”. 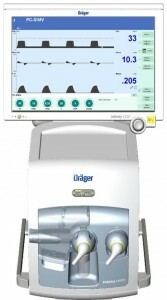 In addition to the explanation of the previous course, VG has another unique point to adjust a delivery pressure depends on presence or absence of spontaneous breathing. 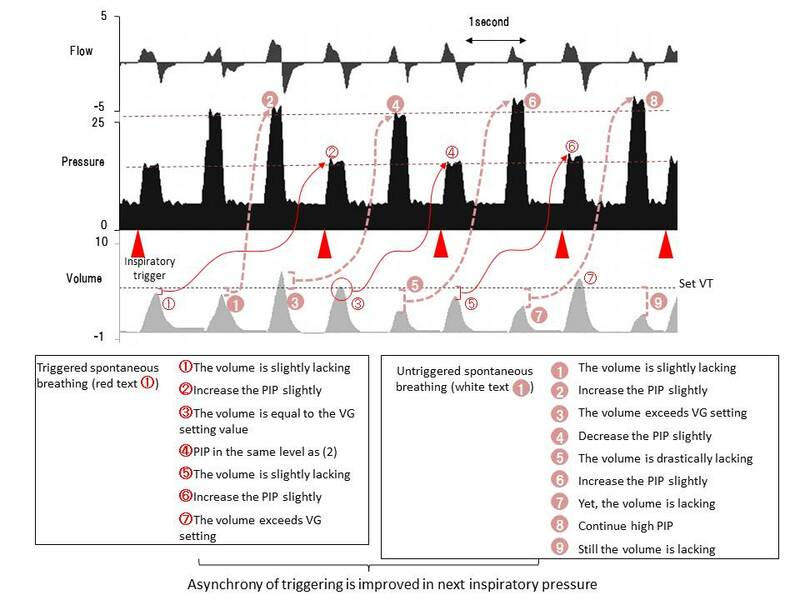 Generally, more volume will be delivered during mandatory ventilation mode when a spontaneous breathing is triggered than without any spontaneous breathing. To maintain the same amount of volume with VG, it has to be distinguished between presence and absence of spontaneous breathing; otherwise, Pulmonary hyperinflation or lack of pressure may occur. To avoid them, the inspiratory pressure of VG is adjusted a breath by breath according to each breath of with or without spontaneous breathing. 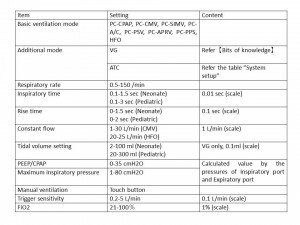 2)Callion NM、et al：Neonatal volume guarantee ventilation: effects of spontaneous breathing, triggered and untriggered inflations、Arch. Dis. Child. Fetal Neonatal Ed、93.2008, 36-39.